Fingerprint readers and iris scanners are great for authenticating people in buildings and on mobile devices. The next big thing in biometrics might lie under our skin. 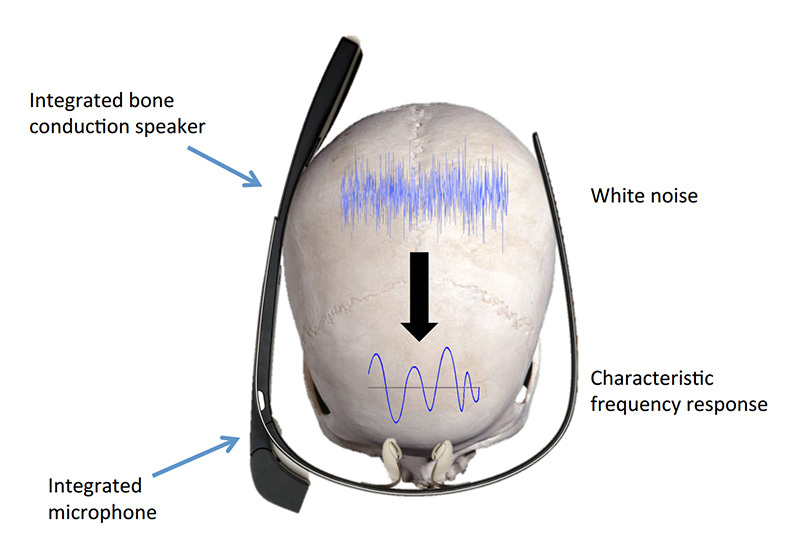 Researchers at the University of Stuttgart, the University of Saarland and the Max Planck Institute for Informatics in Germany are working on SkullConduct (PDF), an authentication system that uses a bone conduction speaker and mic on your head to identify you. Hooked up to a modified Google Glass, it works by playing a one-secong-long audio clip through its speaker and then captures the sound after it’s traveled through the user’s skull. It analyzes the unique frequency to identify the wearer. The team found that their system correctly identified its test subjects 97 percent of the time. So yes, there’s a still a way to go before it works perfectly. There are also a couple of limitations to the system: it may not work as well if there’s enough background noise to interfere with the audio, and factors like users’ weight gain may change the feedback the mic receives, leaving the user locked out of their device. Still, this tech is very much in the research stage so it’ll likely be refined over time. Even if it doesn’t become a mainstream solution, It could be used in conjunction with other authentication methods to serve as a second layer of security. The research team will present their findings at the Conference for Human-computer Interaction in San Jose next month.